Elderly woman with dumbbells. Lady doing exercise outdoors. Healthy muscles and joints. Sport as part of life. 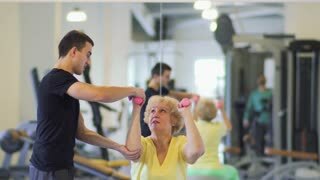 Senior woman with coach in gym doing bridge exercise. Woman doing exercises with dumbbell on a gym background. Pretty smiling girl training with dumbbell with a help of fitness trainer. Male trainer assisting woman lifting dumbbells. Girl doing exercises with dumbbells on a gym background.